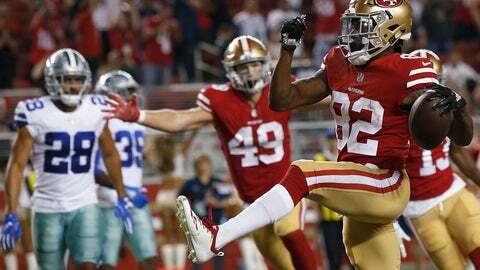 Receiver Richie James Jr. and defensive lineman Jullian Taylor both played from start to finish and delivered big plays throughout in San Francisco’s 24-21 victory over Dallas on Thursday. But both players know there’s plenty of more work needed to make the roster. James was prolific in college, catching 212 passes for 2,959 yards and 20 touchdowns his first two seasons at Middle Tennessee State. But a broken collarbone limited him to five games last year and he wasn’t picked until 240th overall. That’s why it was so important for Taylor to get as much time as he did against the Cowboys. He played 32 defensive snaps in all, starting at defensive end in place of the injured Arik Armstead and playing through the fourth quarter. Taylor just hasn’t done much of it. He went down with season-ending knee injuries in 2015 and ’16 and played just 15 games in all on defense in college. He showed promise as a senior last year with 40 tackles, including 10 for losses, in 12 games for the Owls. He has been impressive in camp, which carried over into his first game action as a pro when Shanahan wanted to get him snaps with the starters to see how he’d fare against tougher competition.